The Armored Car Mk II AA is a Rank II British Self-Propelled Anti-Aircraft Gun with a battle rating of 2.7 (AB/RB/SB). It was introduced in Update 1.55 "Royal Armour" along with the rest of the British tree. This is a low rank British AA car, which, while lacking armour, can pack quite the punch. It has two 20mm autocannons on its turret, and good maneuverability and speed. Unlike the AA of many other countries at this rank, this is a closed top vehicle, and performs well in anti-tank roles. The AC Mk II AA lacks armour, although it is protected from most smaller caliber machine guns at its battle rating. 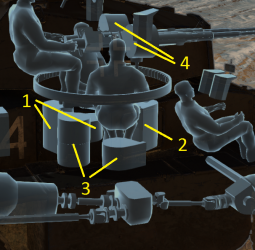 It is advisable to attempt to position yourself above an enemy, so that: A) they will have a lower ability to see you, and B) so that they will most likely end up shooting the lower part of the tank, which juts out. If they shoot here with an AP shell, it will most likely go straight through and merely take out your transmission. Wheels are 2 mm thick, structural chassis is 5 mm thick. A 14 mm RHA plate separates the engine from the crew compartment. The AC Mk II AA is decently maneuverable and has high top speeds, especially on the road. Warning: do not attempt to drive this vehicle on the snow or sand, as it will go more slowly than most heavy tanks at its BR. The AC Mk II AA sports a dual-mount 20mm autocannons, which excels at devastating planes and even light or medium tanks. The AP rounds provided will shred through almost anything, and it is always advisable to take these. Additionally, these allow you to down heavy bombers. Ammo rack of Armoured Car Mk.II AA. 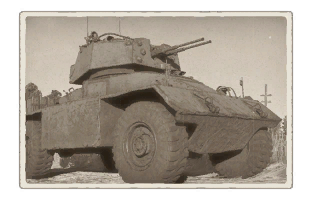 The AC Mk II AA can be used as a support tank in most battles and excels at ambushes. It works well at holding down a capture point, or setting traps along roads. It is advisable to always stay near allies so that you can receive help if necessary. If encountering a heavy tank, attempt to disable its gun first, then take out its tracks and proceed to flank it. If you choose to play the original role of anti-aircraft, make sure to stay in an open (but safe) area, allowing you full range of fire. Sometimes it is advisable to "harass" planes by giving scattered fire to make them think you are a light tank, and then pretending you don't notice them turning to attack you. Aim down the scope until they are within firing range, and shred them to pieces before they have time to react. Due to the heavy ammunition consumption as SPAA in AA fights, stay at an allied capture point to get free ammunition reload during battle. Like every other vehicle, the "Parts" and "FPE" modifications should be prioritised so you won't lose your vehicle due to being disabled. After that, prioritise ammunition, aiming for "APT". Everything else is still essential to upgrading the vehicle. The basis of the armoured car comes from Associated Equipment Company (AEC) of Southall, Middlesex. AEC was a manufacturer of truck and bus chassis and the Matador artillery tractor. The armoured car was privately developed in 1941 and was based off the Matador. The design was shown to British officials in the same year during the Horse Guards Parade and was received favourably by many, including Winston Churchill. Orders started filing in for the armoured car, and AEC tried to give it comparable firepower to current tanks at the time. Thus, the first version, Mk.I, came with a turret adapted from the Valentine tank equipped with the 2-pounder. The next version, Mk.II, had this upgraded with a heavier turret and a 6-pounder gun, then with the QF 75 mm gun on the Mk.III. An anti-aircraft version using the same turret from the Crusader AA Mk II and the twin Oerlikon guns was also developed onto the armoured car. During its production life from 1942 to 1943, 629 Armoured cars in total were built. The Armoured cars equipped with the tank guns were used in North Africa in late 1942. Some on-field modifications include changing out the Valentine turret for a Crusader turret with the 6-pounder. The armoured cars continued to see fighting in various parts of Europe in combination with other armoured cars and remained in service until replaced by the Alvis Saladin in 1958. Though the anti-aircraft version was made, it never entered production due to the growing Allied air superiority over the Axis forces, making the anti-aircraft version unnecessary to guard the advancing Allied units from air attacks. This page was last edited on 10 February 2019, at 21:42.